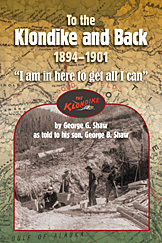 To the Klondike and Back (1894-1901) "I am in here to get all I can"
Adventurous 22-year-old George G. Shaw was determined to strike it rich in the Klondike gold fields when he headed west from Vermont in 1894 first to Seattle and then on to Alaska and the Yukon Territory. Here he braved the perils of wilderness travel — an unforgiving mountain pass, treacherous whitewater rapids — finally arriving in raucous Dawson City. In the Klondike, mining for gold challenged Shaw's considerable skills and strength, but he persevered, buoyed by his confidence and resourcefulness. After his gold-mining days, Shaw's adventures continued with a solo trek through remote Alaska and a storm-tossed schooner voyage that landed him in Siberia. Seven years later he returned home with some money in his pockets and memories to last a lifetime. Over the years he savored and shared the vivid recollections of his personal experiences as a gold miner and traveler with his son. To the Klondike and Back is by George G. Shaw as told to his son, George B. Shaw. George G. Shaw was born in 1872 in Long Lake in the Adirondacks Region of New York. He set forth on his adventures from Vermont to which his father had moved the family in 1890. After returning to Vermont in 1901 he tried a few jobs and traveled a bit more, then in 1920 married and settled down as a Vermont farmer until his death in 1958. His son George B. Shaw, born in Bridport Vermont, listened to his father's stories over the years, wrote them down, and compiled them into a manuscript that his daughter typed in 1980.